Doing regular of exercise is important for so many reasons, but in this situation let’s look at how it can help the neck. Our necks do an an often underrated, difficult job, holding up and back our heads, which in itself weighs a little bit more than a bowling ball. This job becomes increasingly harder if we spend our days at a computer or in the car or carry ourselves badly letting our head sit out in front of our neck. Getting the right exercises done will help keep the head over the neck and help get the shoulders back into correct position. Getting your stabilising neck muscles stronger helps to support the spine and helps reduces stress to the static structures like the discs and the facet joints which can’t get escape the postural strain otherwise. Doing these exercises regularly can go a lot of the way to preventing neck pain and if you suffer from neck pain, it’s all the more important to take the pressure off your neck by helping to support and strengthen the neck muscles. If you have an existing neck problem it is prudent to mention that these exercises must be done at the appropriate time of recovery and seek advice if you are not certain. The Chin Tuck can help reverse forward-head posture by strengthening the neck muscles. This exercise can be done sitting or standing. Start with your shoulders rolled back and down. 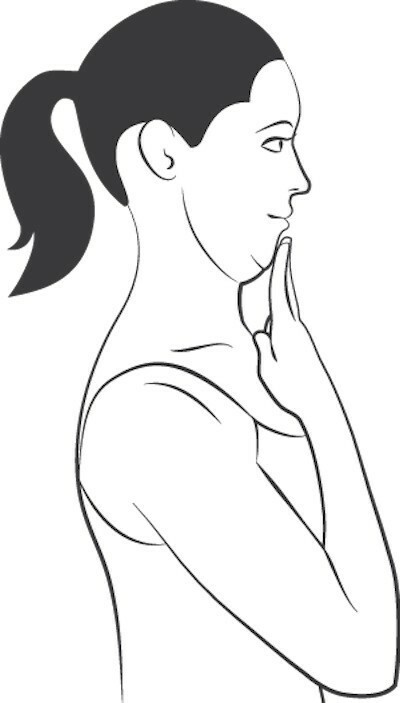 While looking straight ahead, place two fingers on your chin, slightly tuck your chin and move your head back (image at left). Hold for 3-5 seconds and then release. Repeat 10 times. Tip: The more of a double chin you create, the better the results:-)) Try to do 15-20 repetitions holding for 10 seconds. Stand wit h your back against a flat wall with your feet about four inches from the base. Maintain a slight bend in your knees. Your muscles in your backside, (the glutes), spine and head should all be against the wall. Bring your arms up with elbows bent so your upper arms are parallel to the floor and squeeze your shoulder blades together, forming a letter “W” (image at left). Hold for 3 seconds. Next, straighten your elbows to raise your arms up to form the letter “Y.” Make sure not to shrug your shoulders to your ears. 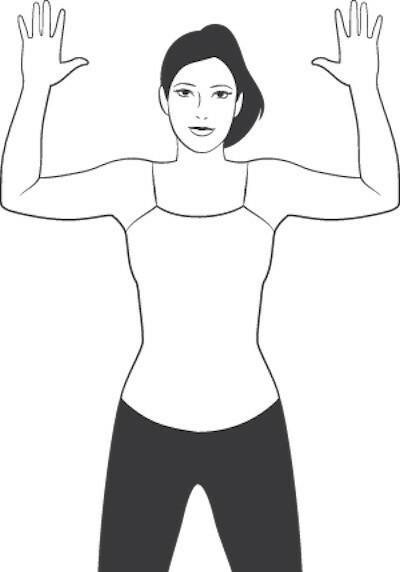 Repeat this 10 times, starting at “W,” holding for 3 seconds and then raising your arms into a “Y.” Do 2-3 sets. This exercise loosens those tight chest muscles! Standing in a doorway, lift your arm so it’s parallel to the floor and bend at the elbow so your fingers point toward the ceiling. Place your hand on the doorjamb. Slowly lean into your raised arm and push against the doorjamb for 7-10 seconds. Relax the pressure and then press your arm against the doorjamb again, this time coming into a slight lunge with your legs so your chest moves forward past the doorjamb for 7-10 seconds (image at left). Repeat this stretch two to three times on each side. Kneel onto your right knee with toes down, and place your left foot flat on the floor in front of you. Place both hands on your left thigh and press your hips forward until you feel a good stretch in the hip flexors. Contract your abdominals and slightly tilt your pelvis back while keeping your chin parallel to the floor (image at left). Hold this pose for 20-30 seconds, and then switch sides. This exercise helps strengthen your upper back muscles, especially the ones between your shoulder blades (the rhomboids). Sit on the floor with your legs extended forward. Place the middle of the resistance band around the bottom of your feet and cross one side over the other to form an “X”. Grasp the ends of the band with your arms extended in front of you. 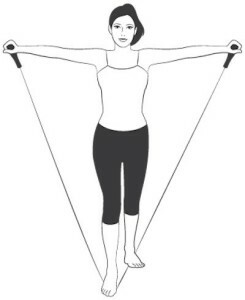 Pull the ends of the band toward your hips, bending your elbows so they point backward (image at left). Hold and slowly return. Do 8-12 repetitions for three sets. According to a 2013 by the Scandinavian Society of Clinical Physiology and Nuclear Medicine, performing this simple resistance band exercise 2 minutes a day, five times a week, will significantly decrease your neck and shoulder pain and improve your posture. While standing, stagger your feet so one is slightly behind the other. Grasp the handles, or the ends, of the resistance band and lift your arms upward and slightly outward away from your body about 30 degrees. Keep a slight bend in your elbows. Stop at shoulder level; hold and return. Make sure to keep your shoulder blades down and back straight. Repeat this exercise for 2 minutes each day, five days a week. If you have existing, ongoing upper back, neck pain or headaches as well as poor posture, you may need or benefit from consulting with your chiropractor or other appropriately qualified spinal health care professional before taking on exercises programme with your back on your own. In reality you may need assessment to diagnose what particular type of problem you have and be given exercises and possibly treatment specific to your own circumstances. If in any doubt feel free to call or email our clinic, where one of our friendly team would be delighted to advise you. For your convenience all of our clinical team are registered with VHI, Aviva and Laya Healthcare allowing clients claim reimbursement from a wide range of private healthcare Insurance providers. T : 053 94 83338 or alternatively email info@chiropractor.ie. Gorey Family Chiropractic Clinic, Railway Road, Gorey, Co Wexford. This entry was posted in Back Pain, General Information, Neck Pain and tagged better posture, chiropractic wexford, chiropractor, chiropractor Gorey, exercises for good posture, exercises to strengthen your back, headache, headache relief, headache treatment, how to correct posture, how to fix bad posture, migraine, Neck and Shoulder pain by admin. Bookmark the permalink.